Mochizuki was impressed by Hyo pinning a member of the Triangle Gate champion team. Minoura also picked up a big win in the opener. He figured this was a good time for them to follow Shun & Yoshioka and get a championship opportunity. He offered to team with them to go for the Triangle Gate. Minoura was game. Hyo had a fire lit under him by Shun & Yoshioka. He was also in. Kazma was unimpressed by the green boys. They win once in a blue moon and suddenly start throwing out challenges. They’re getting a bit too carried away. Whatever. If they want a match they can have it. It will be a good chance for him to give them a wrestling lesson. Mochizuki told him he talked a good game. He fancies himself a teacher? Mochizuki has taught them more than enough to beat the likes of him. If he lets Kazma teach his screwy style to them, they will grow up screwy like him. No thank you. Kazma preferred screwy wrestling. When you learn wrestling from someone like Mochizuki, you end up straight as an arrow. That makes you very very easy to snap in half. Mochizuki again was impressed by his response. The thing he won’t be able to break is their will. He’s accepted the challenge so there’s no backing out now. He will leave the particulars of the match to GM Yagi. Punch Tominaga made his first public appearance since his ankle surgery back at the end of 2018. He was able to dance with Natural Vibes. He announced he would be returning to action this month (This was later set for April 24th in Kobe). Legendary manager Shogun KY Wakamatsu was at ringside for the Strong Machines debut and he acted as their hype man afterwards. Hey! Showa, Heisei, Hey! The Strong Machines are activated for the Reiwa Era, too. J thanked him for coming all the way from Hokkaido. Do people want to see more of the Strong Machines? Wakamatsu fought in the Showa Era. He fought with Antonio Inoki. The start of the Reiwa Era is the time for the the Strong Machines to re-activate. Doi set up Ishida for the Ultra Hurricanrana, but then gave the Bakatare Sliding Kick to Kid to take him out of player, then followed with another on Ishida for the win and the right to become the MaxiMuM rep in the cage. Too bad for Dragon Kid. Of course, he wasn’t planning on losing the match so DK could rest a little easier. As long as he properly supports Doi in his efforts to escape, Doi will be much less likely to exercise his option to kick him out afterwards. Maybe. You just never know what is going to happen. Yoshino was livid. This was the worst possible result for MaxiMuM. He proposed that he & Doi have a singles match to decide who will be their rep. Doi refused and they argued while Yoshino persisted. Doi flat out refused. He won the match already. He will represent MaxiMuM. Yoshino should know better than anyone. Doi suffers from a rare disease called Traitor Syndrome. It flares up every now and then. It could even flare up in Aichi. Not just DK & Yoshino, but Ishida & Jason should also make sure they are doing all they can to support his escape efforts. Shimizu seemed to be just as shocked as anyone that he won. Just last month he was begging for this match to be cancelled. No one else wanted to cancel it. Because they wanted to kick him out, right? For sure. That’s why. But today, he won. He won’t be getting kicked out. But now what will he do? What to do, what to do…..
Eita quickly assumed it meant he was out of R・E・D. He wasn’t going to start groveling to the likes of Shimizu. If he wants to kick Eita out he should go ahead and try it and see what happens to him. Yoshida had just one thing to make very very clear. He was …NOT on Eita’s side! This created some tension with Kazma and Kanda. They were Triangle Gate champions together but now Yoshida is siding with the opposing faction. Yoshida told Candy he should shut up or he could find himself kicked out. The lines were drawn pretty clearly. Shimizu, Ben, & Takashi on one side, Eita, Kazma, & Kanda on the other. Shimizu told the others that it isn’t too late to join the winning team. They were welcome at any time. May 6th was going to be hella fun. Backstage, Big Ben were confronted by YAMATO & KAI who challenged them to a Twin Gate title match. Shimizu was riding the wave right now so he accepted. This was later set for April 28th in Hakata. 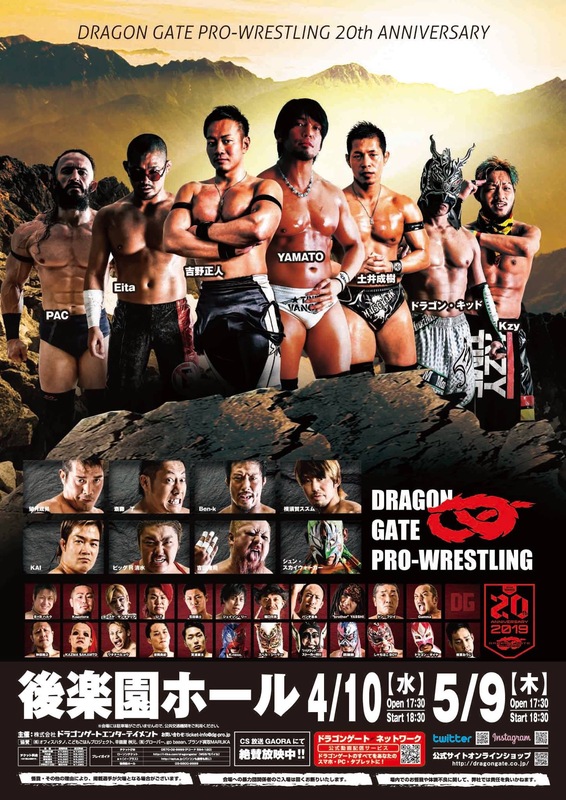 YAMATO is from the Dragon Gate generation. Himself, Yosuke, U-T (but not so much Kagetora) all come from a different time. They don’t know anything about Toryumon or Aaganiisou. Either way, he’s very happy and thankful for them to come back to Dragon Gate and fight with them. Both sides exchanged pleasantries and hugs. YAMATO had one more message for Shuji Kondo. YAMATO has been at the top of Dragon Gate since shortly after Kondo left. Maybe Kondo wants to fight a little more? Sometime, somewhere, they will meet again. Masato Yoshino made an awkward appearance at this point. He also had some greetings, especially for Kondo. He hasn’t had a chance to talk to him from the ring like this in a long time. He was also very happy to see Jet. Just seeing the Jet Punches made him very happy to be in the building today. They were welcome to come back any time. The people were probably wondering why he came out here at this time on his own. 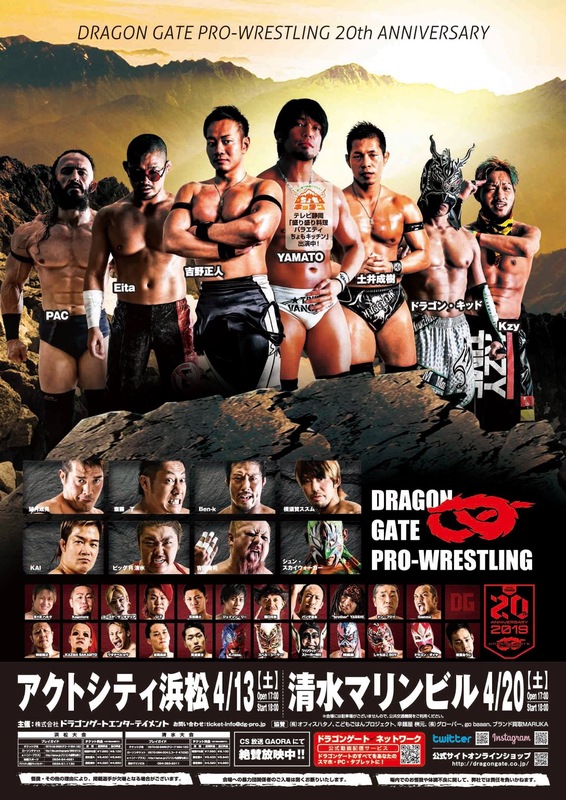 Dragon Gate is celebrating their 20th anniversary this year with various special matches here in Korakuen Hall. Of course, the celebration will peak in July at Kobe World Kinen Hall. There is a particular wrestler Yoshino wants to have appear on that show. That wrestler is Ultimo Dragon. Without him, Dragon Gate would not exist. But, this is easier said than done. 15 years ago, Toryumon became Dragon Gate and they went their separate ways from Ultimo Dragon. Since then, he hasn’t seen or spoken with the man. He has no way to get in touch with him. So, he was going to use this useful platform of live streaming & television & mass media to send his message. He doesn’t use social media himself, but surely the message will also make it’s way there. He has faith that it will reach Ultimo Dragon. His message is simple. “Ultimo Dragon, please come to Dragon Gate!”. They come to Korakuen Hall every month. The date for next month is May 9th. He will be waiting for Ultimo Dragon to come. He passed back to YAMATO, who gave a quick plea for Yoshino to get on social media. Sugawara interrupted to call out Anthony again. This time he came out with Ryo Saito. Using Saito to speak for him he thanked Sugawara for coming today. Last month, he recklessly to the microphone and spoke for himself. This is unacceptable for someone in his position and he was very sorry. Therefore, Saito will do the talking for him. Sugawara again tried to goad him into a fight, to which Mori firmly refused (through Saito). As he now had to go and sell tickets for the May 9th show, Mori returned backstage. Sugawara promised not to give up. He passed back to YAMATO who finally got to close the show. They celebrated the main event win and Yosuke returning. Yosuke was ready to get back down to the business of kissing everyone on the roster. YAMATO was flustered as usual. A lot happened today. A lot will probbaly happen next time so hopefully everyone will come back again.